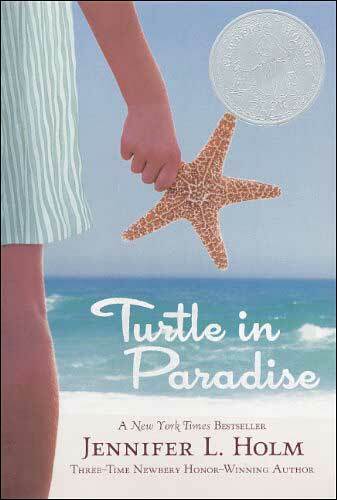 Turtle in Paradise: It's the middle of the Great Depression, and 11-year-old Turtle has been sent to Key West to live with relatives. Once there she discovers a different way of life and a household full of rambunctious cousins who have a strict 'no girls allowed' policy. Excluded from their activities, Turtle soon finds her own adventures in the form of a treasure map and dreams of life on easy street. This is neither a stark look at the hardships of the depression nor is it a sentimental tale of yesteryear. Holm does an exceptional job of recreating the era and packing in loads of interesting historical tidbits. In fact, Holm hits it just right for this age group, creating a book that is part historical fiction, part adventure tale, and part hilarious romp. It's a pleasure to read, with characters that are fresh and engaging right from page one. Kids won't realize how much they're actually learning about life during the Great Depression! An excellent Author's Note at the end provides information on Key West during that time and on the people referred to in the book. Letters Home to Mom: A fun writing exercise to accompany Turtle in Paradise is to have students write 'letters home to mom' at various stages in the book (ie... divide the book up so as to create five letter writing assignments.) In the story, Turtle is away from her mother, living with relatives in Key West. Have the students pretend to be Turtle writing letters home to tell her mother about what is going on in her life, what she thinks about life in Key West, and what she is looking forward to when they reunite again. This could be a good way to assess whether the students are reading and understanding the book, plus work in additional writing practice.